In these austere times, could it be possibly be true that at least five County higher ups just got raises ranging between $10,000 and $16,000? Could it be true that the Human Resources (HR) Head in charge of setting salaries received one of those whopping raises? Along with her significant other? What a happy household that must be! Could it be true that the head of our Community Development and Planning Department (CDPD), a Building Inspector by profession, received one of those raises at a time when we have hardly any building going on? What was the raise for? All that great work on the CAOs? Our County Engineer too ... and the Head of the Health Department, while some of the worker bees in the County were told to tighten their belts, and received cuts of more than $8,000? Our County has yet to speak publicly about these increases, but sources say it's a done deal. If these accounts are true, then at the very least, it is one more example of our County's gobsmacking poor judgment (and timing). On the one hand, our County is crying poor and asking us to approve a ballot tax measure, and with the other hand, they're handing out newly fattened paychecks. Would Pacific County act this way? Today, I received my County flyer about the "Public Safety Sales Tax Ballot Measure." 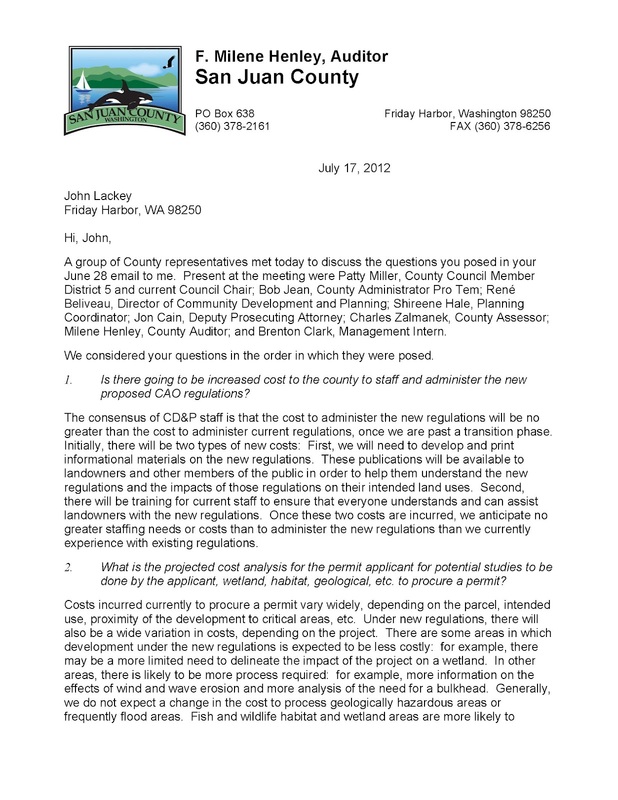 The flyer threatens, "cuts will be required to Public Safety and other essential County services including: Sheriff, Prosecuting Attorney, Courts, Emergency Management, Public Health, Roads, and Others." That sounds plenty scary, but then we find out how our County has prioritized expenditures. "Cuts" will be required for all those really important things, but our County is ensuring that HR is amply funded? How can that be? Do you feel safer knowing that our Head of HR just got a big fat raise even though essential services might be cut? More on our County's smoking crater of credibility as details emerge. Today we saw our County trying to mount a defense to counter the economic analysis conducted by Nick Jones. Much of our County's counter argument made no sense because the County's comparisons didn't really justify why our cost of government should be as high as it is, even if there are differences between San Juan County and Pacific County. Our County almost seemed to be saying that if we have it, we should spend it. However, the County counter-salvo mostly tried to convince us that San Juan County and Pacific County are not comparable at all. In terms of wage and employment, Pacific County even outperforms us slightly. San Juan County is 31st out of 39 counties in terms of employment, and we are one of only 4 counties in the state whose weekly wage doesn't crack $600. Despite that, our County budget is about $36.5 million per year while Pacific County's is about $23 million. That disparity wouldn't have anything to do with government waste here, would it? Or anything to do with our "destination marketing" posture which requires us to size everything at tourist capacity rather than the capacity of our tax base? Whatever the reason, our public officials are never to blame, not by their account anyway. If we listen to our public "servants," we always need to give them more. Shireene Hale never met a parcel that didn't require more "protection," and she's about as ardent a supporter of ever stronger stormwater controls as there can be. Is Shireene an advocate for a better ecological environment or a better fiscal environment for her department (Planning)? I suppose it is mere coincidence that her husband is the head of the dysfunctional County stormwater program, too? During this week's Council deliberations about the Fish and Wildlife Habitat CAO, nearly every expert who spoke in favor of the ordinance had a job dependent on it. In fact, the only speaker whose economic future was not tied directly to the ordinance, Mindy Rowse of NOAA, said, "I don't think anyone is doing anything wrong" here in San Juan County. Some citizens might be so discouraged by our rigged system that they feel it's a conspiracy. I don't think it's a conspiracy. It is worse than a conspiracy. It is a system of interlocking, reinforcing self-interests that serve to create an impression of impending ecological doom as a means for mutual gain (mutual gain for the participants anyway). It's a system that creates an eco-aristocracy comprised of non-profits and government in league against private individuals. It is a system that portrays individuals and property rights as the enemy of the environment, when in fact, they can be demonstrated to be some of the best protectors of the environment. We can be pro democratic, pro personal responsibility, pro people, pro freedom, pro property rights, and pro environment. Pro bureaucrat won't cut it, though. Nothing is worse for the environment than bureaucrats trying to advance their own careers and interests at the expense of the rest of society. We should be trying to save the environment for our children's future and our grandchildren's future, not saving bureaucrats for our children's future and our grandchildren's future. Central planning and micro-managment accrue benefits only for central planners and micro-managers. Any central planner laboring to enact ecological imperatives supposedly more important than the rights of individuals is embarking on the journey that Isaiah Berlin warned us against when he spoke about the perils of positive liberty. Ultimately, that coercive path must necessarily conflict with democratic values, economics, and protection of the environment. Today, during public access time, a citizen happened to preface his opening remarks with the polite entreaty, "Correct me if I'm wrong." Our Council Chair shot back, "Oh, I will." That kind of snotty disrespect is emblematic of our County's overall contempt for its own citizens. Only bona fide members of the County central planning echo chamber (or should that be eco-chamber?) are allowed to be right. Makes you wonder whether the rest of us exist at all. If a tree falls in the forest, and there are no citizens around to hear it, are we still wrong? Folks have been reacting to the comparative budget analysis performed by Lopezian Nick Jones. Most people have been very supportive, and many citizens think Nick did a heroic job that is long overdue. 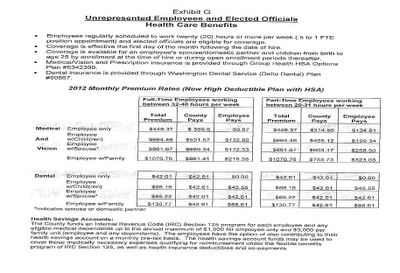 For those who haven't seen the analysis, Nick computes the cost of government here versus other counties in Washington. He finds that costs are significantly higher here than in all other counties. Surprised? Nick's clearly stated and well supported claim has brought out the traditional County apologists, who are attacking Nick's analysis on a variety of dimensions. One of the people trying to "set the record straight" is Sharon Kivisto of sanjuanislander.com. In the past, she has been fond of saying that we have the lowest tax rate in the state, and when you look at the tax rate on a per parcel basis, there is some support for her claim. However, when you look at tax rates on a per capita basis, the view is completely different. We have the highest, not the lowest, tax rate, and that is the gist (and genius) of Nick's analysis. Since it is people who pay taxes, not parcels, the better benchmark is to examine the burden on the taxpayers. In her response to Nick's analysis, Kivisto uses many of the same arguments that we've heard over and over, especially during the solid waste fiasco: we have higher costs here; we have triplication of facilities; we have to ride the ferries. All have a grain of truth to them, but these "reasons" for our higher costs are overused and abused excuses. Ultimately, the public grew tired of these excuses for solid waste incompetence, and I think the same is happening with respect to the County as a whole. More and more people are refusing to buy into the County's schtick. The County is about to pass a "tax" (CAO/SMP) that will cost private citizens a whopping amount off their personal "balance sheets." It will provide essentially no revenue to the County, but increase government's enforcement responsibilities and associated costs. The County is committing itself to what amounts to a no growth strategy, but they still want increased tax revenue too. We hear some Councillors say we "need to at least maintain what we have" regarding county infrastructure. But the County is not equally committed to the premise that private citizens should be able to "maintain what we have." 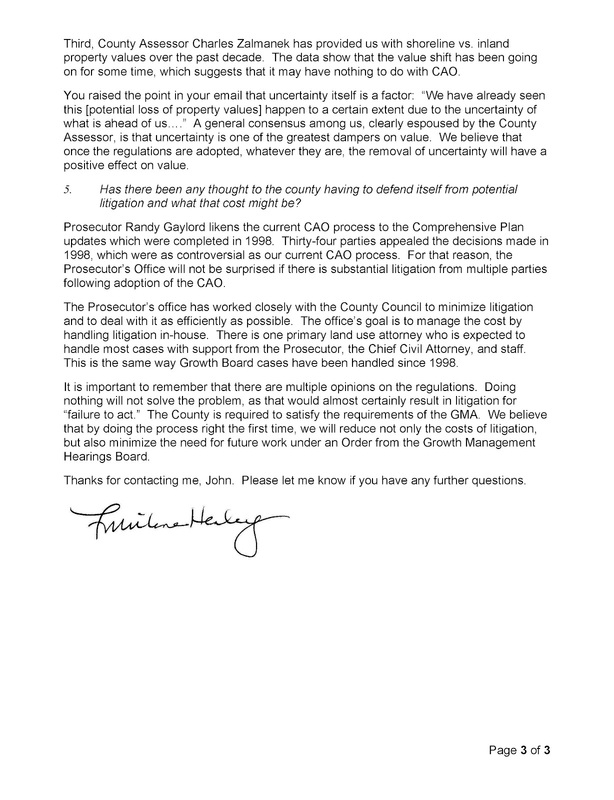 In fact, via non-conforming policies, buffers, etc., it seems the County is doing everything it can to make sure we are forbidden from maintaining what we have. The County has shown no respect for maintaining the capital infrastructure of people's lives. With no growth, all taxation efforts are a zero sum game, and government revenues can only be increased at the expense of the rest of society. It turns into "us versus them." 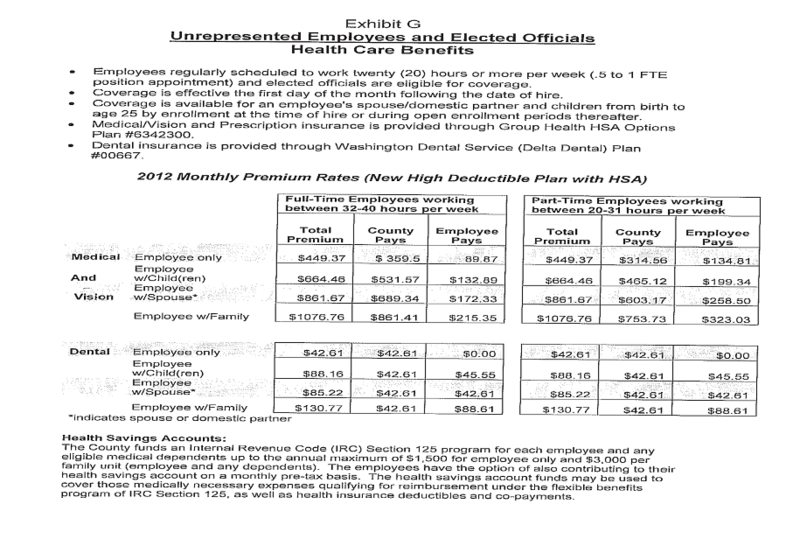 Speaking of "them" (see attachment), how many people do you know who work 20 hours/week and get $753 per month paid by their employer toward health insurance (and dental) AND $3,000 for a spending account? How many people do you know who work 20 hours/week (or even 40 or 60 for that matter) and get their kids covered UNTIL THEY ARE 25???? And a 3% COLA ... or full-time pension benefits? The phrase made famous by James Carville resonates in our county today. Despite appearances, our pitched environmental battles here are not about the environment. They are about economic programs disguised as environmental programs. The Friends, for example, are not against development. They are very much in favor of Scenic Byway/transportation corridor development. That's the kind of development that favors their interests and business model. Never mind the environmental impact of tourists, which some studies suggest generate as much as 5 lbs of trash per day and use 100 gallons of water per day per tourist. That doesn't matter. What matters is that the Friends get an economic development program that suits their continued growth and power base. Tourists come here; fall in love with a crafted marketing image of the San Juans as a threatened natural paradise and then return home to donate to the Friends from afar. Plus, the Friends then get to use "visual impacts" to the Scenic Byway as one more legal strategy for hauling landowners to court or the Hearing Examiner, as already has happened on occasion. As business owners we have a strong interest in the economic health of the San Juan Islands. The economy of the San Juans depends on the natural beauty and recreational opportunities that attract residents, visitors and businesses to these islands. Folks, I have news for you. That's not a conservation message. That's a destination marketing message. That's not Rachel Carson or John Muir. That's Disneyland. That's using the environment for marketing. This county is full of pretend environmentalists pursuing their own economic self interest while simultaneously wanting the sanctimonious image benefits from their eco-glorymongering. The eco-tourist economic development path is the road to perdition, and by perdition, I mean County bankruptcy. It creates infrastructure needs that have to be sized for the peak season, supported by a tax base sized for the off-season. Couple that with our County's collective fiscal irresponsibility, and we are on the same trajectory as all those charter governments in California that are going bankrupt. Yes ... bankrupt, just like our insolvent solid waste program. We need to start talking about it because that is where we are headed, in my opinion. And it's not the fault of the "CAO virus" or "property rights" groups, or the bogey man or some other scapegoat. Our whole County is run the way our solid waste program was run. We do not have a sustainable model for government here in the islands, and our incapable public servants lurch from crisis to crisis in groundhog day fashion, surprised at every turn by foreseeable events. Coming up with a truly equivalent comparison from county to county is extremely difficult: Counties all spin budget numbers in slightly different ways, counties vary wildly in percentages of population in incorporated towns and cities, percentages of unoccupied or vacation homes can drive up county expenses and drive down population figures. And of course geography play a large role in the expense of administering a given area--a county composed of islands is a special case when it comes to delivering services to all residents--though there is some adjustment too for the much greater mileage of county maintained roads in any mainland county. That said, the discrepancy between all levels of SJC budget and spending and that of other rural, waterfront Western WA counties is shocking. In the rawest form, unexamined numbers from other rural Western Washington show San Juan County spending as a wild outlier. Total county spending per capita, including general fund and non discretionary spending, ranges from $825 per capita in Island County (Whidbey and Camano Islands), $990 per capita in Clallam County to $1084 per capita in tiny Wahkiakum County, with practically no services provided by incorporated towns. San Juan County total spending currently runs $2613 per capita, or 241% of Wahkiakum County's expenditures. Pacific County in South West Washington seems to have more in common with SJC than any other Washington county. It has many of the same factors and limitations as SJC, and some unique or steeper challenges than we have here. Their raw budget comes to $1464 per capita, or exactly 56% of San Juan County spending. More of that to come in later posts, along with economic analysis done by other citizens too. The excellent work done by these private citizens stands in stark contrast to the pathetic economic non-analysis done by our own County. It's one more example of how our County, dominated by special interests, doesn't do analysis. It's simply an out-of-touch echo chamber. Why do we keep electing, appointing, and hiring people who perpetuate it? Collectively, our government officials have decided the CAOs will have no cost. Amazing isn't it? All these new code sections that "fix" all these terrible environmental problems we suffer from, and they'll hardly cost a penny. They're all benefit and no cost. Free lunch for everyone. That's what our Auditor says. That's what our Council Chair says. That's what our Deputy Prosecuting Attorney says. The Assessor too ... oh ... and our Acting County Administrator and CDPD staff ... don't forget our temporary County management intern. For its lack of effort and simpleton logic, the memo below would have been an embarrassment had it been written by our County intern, so it is all the more disturbing that it was authored by our seasoned County Auditor who holds an undergraduate degree from Harvard and an MBA from Stanford. 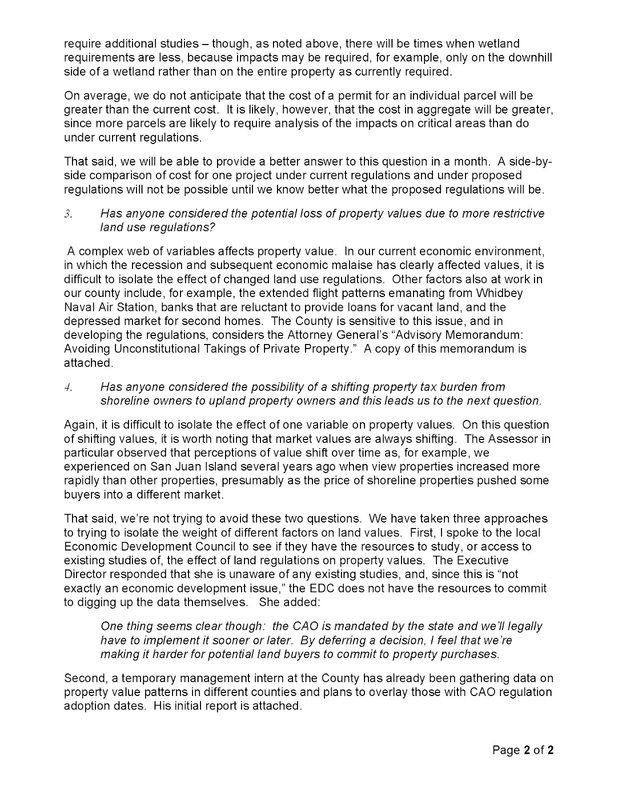 A planning commissioner asked our well-qualified Auditor for her independent economic analysis of the impacts of the CAOs. In response, our Auditor principally acted as a scribe to convey the consensus opinions of herself and seven other County officials (intern included). 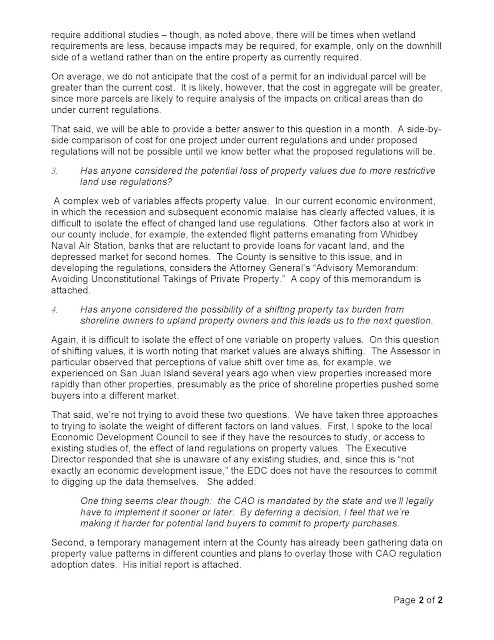 A complex web of variables affects property value. It is worth noting that market values are always shifting. 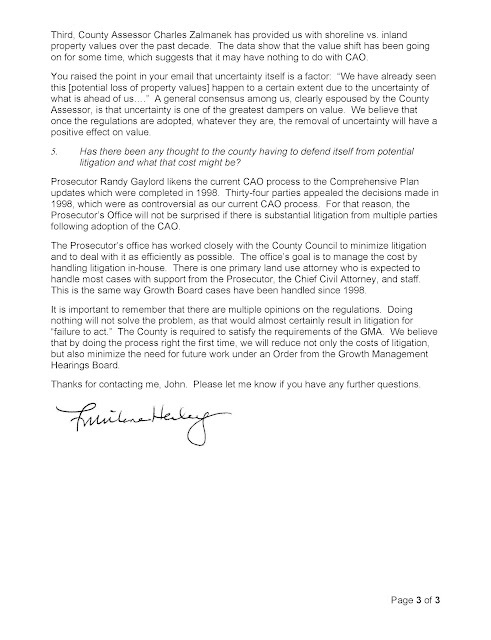 One thing seems clear though: the CAO is mandated by the state and we’ll legally have to implement it sooner or later. The County is required to satisfy the requirements of the GMA. Gripping albeit redundant stuff ("required to satisfy requirements"), but it fails to consider why our previous County Administrator contemplated the specter of "bankruptcy" in his last two budget documents. It fails to account for the Council's own observations that the CAOs could cost a bundle. It fails to acknowledge that our Prosecuting Attorney's office is asking for more funding. It's funny how these non-costs can pile up. Solve the problem? Failure to act? About what? What problem? Will anyone ever say what it is? The ending of the letter unabashedly displays all the prejudice permeating the CAO process. It assumes there is a problem without ever stating what it is. Our County officials believe in environmental problems they can't describe, and they believe in legal restrictions and government services that have no cost. Back on June 8, the Trojan Heron blogged about the over-budget redesign of Odlin Park on Lopez. I am unaware of any pressing need to redesign this park, and in fact, many long-time Lopezians have a soft spot for the park the way it is. They consider it the only park that has truly been the "locals" park on Lopez over the years. In the old days, the island even hosted the 4th of July celebrations there, complete with a community ball game ("marrieds" versus "unmarrieds") mixed in with other park festivities. But someone got it in their head that the park had to be redesigned, including the addition of many more camping spaces for tourists. For some, this is just one more example of how the local government here will go to any lengths to make the place friendlier to tourists and less friendly to islanders. The cost overruns at Odlin are attributed substantially to the cost of complying with a variety of environmental regulations. As mentioned in the earlier post, it would seem the County is squarely in its own crosshairs on the CAOs/SMP since it will be increasing its own costs. Odlin Park is the harbinger of things to come. In the attached video, you'll see what a circus we have become. As long as it's "within our bonding capability," it seems that the jokers on the Council will laugh it off and go along with anything. I wonder how long before our bondholders decide that the financial risk associated with our grant-loving, debt-making, economy-killing approach to running a County is no laughing matter. The Trojan Heron wishes everyone a safe and happy Independence Day Holiday. Please take a moment to follow this link to the National Archives website to read about our nation's Charters of Freedom. Follow this link to read the Washington State Constitution. Follow this link to read the Magna Carta, the document that started it all. We are told that the CAOs will pass at least five to one in a couple of months. Write your Council person and challenge them to answer if they are one of the "San Juan County Five." We are ruled by people who live by illusion ... that the way to save the environment is to build government bureaucracies ... that the way to conserve land is to promote unbridled eco-tourism ... that the way to a healthy economy is to promote subsidies, grants, and loans but not jobs ... and that serving the public good means ignoring citizens while cravenly submitting to pressure from mid-level government planners, policy wonks, and their contractors. The San Juans have the lowest percentage of wage earnings of any county in Washington. Only about one-third of our income comes from wages. The hourly wages of our working population are half the state average too, and many wage earners need to work two or three jobs, if they can find them. We have affordable housing but not affordable jobs, and those in public office see no irony in severely restricting one of our economic factors of production (land) while still wanting more subsidies from government and more taxes for government. Preliminary analysis of the census demographics suggests our slight population increase over the last decade may have been driven by hispanics moving to the islands, largely to fill low-wage service jobs. The heralded tourism industry will only add to our low-wage woes since tourism also promotes low-paid service jobs. Paraphrasing Walter Mondale from 30 years ago, we shouldn't want an economy based on wrapping hamburgers and sweeping up around Toyotas, although in our case we might also reasonably include an economy consisting of summer interns, masseuses, yoga instructors, sustainability experts, and life coaches living in affordable housing. But that's the economic vision of the San Juan County Five. As seeming confirmation of our anemic and pathetic economy, the latest GMA population projections from the Office of Financial Management even show the possibility of a population decline in the islands for the first time since those statistics have been issued. The reaction from those in power? Crickets. No change in the growth-killing agenda promoted by the San Juan County Five. As far as the Five go, they want more of the same and at an accelerating pace to boot. More restrictions on land. More low wage tourist jobs. More subsidies and grants for affordable housing, more money for soft-science (dare I label it as "hoax" science? ), and more for soft-agriculture too. And of course, we'll need a lot of coordinating committees and quangos of every flavor and stripe to manage all the inherently contradictory restrictions and handouts. That is the real reason for faux environmental hysteria: to provide a mock crisis that justifies the growth of quangos, NGOs, regulations, and all manner of needlessly restrictive government. The point isn't to solve anything. The point is to promote an ever-enlarging apparatus of stifling ill-qualified bureaucratic oversight and the unlimited exigent expense that goes along with providing sinecures for self-interested crisis-creating pointy heads. Quite simply, our County is out of control and out of its mind. Talk about sustainability?!? Nothing about this picture is sustainable. It's a strategy of dependency and perennial crisis. The viral CAO proposals do not solve problems; they create them. The policies of the San Juan County Five amplify every existing problem we have while addressing not a single demonstrable ecological concern.